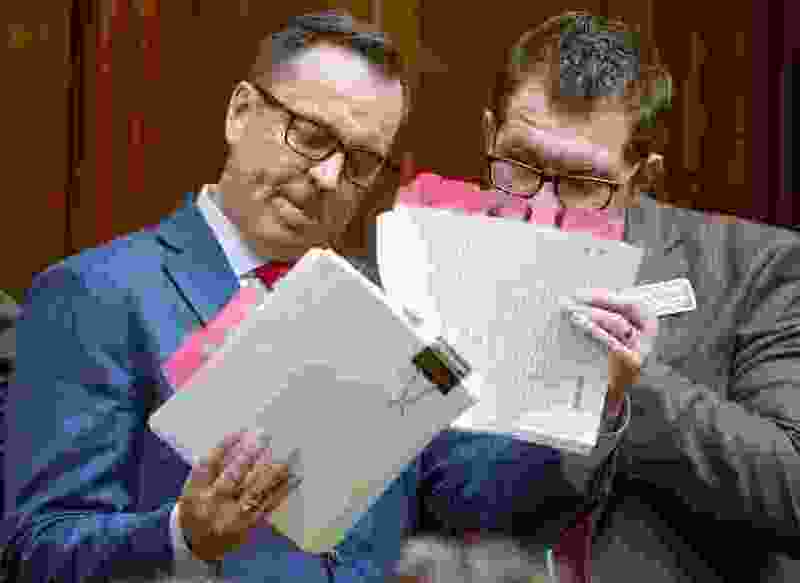 (Leah Hogsten | Tribune file photo) In this Dec. 2, 2018, file photo, then House Speaker Greg Hughes, left, thumbs through his proposed legislation with Michael Curtis, with the Office of Legislative Research and General Counsel, while answering questions about the Utah Medical Cannabis Act — a bill negotiated to override Proposition 2 passed by voters. While no longer speaker or in public office, Hughes is still working — without pay — to make sure the cannabis law is implemented and works as intended. Former Utah House Speaker Greg Hughes wasn’t always a strong believer in medical cannabis programs, but now that he is, he’s out to bring others into the fold. The Utah Medical Cannabis Act passed by lawmakers in a December special session was the booming finale to Hughes’ roughly 16 years in the Legislature, dominating his final months in office. And it seems that he’s carried it with him into civilian life. Hughes says that since the enactment of the bill, a replacement to the voter-approved medical cannabis initiative, he’s conversed with a leader in Utah’s largest health care network, powerful financiers and even his personal pharmacists to spread the word about the state’s fledgling marijuana program. He says he’s doing it for free, having no financial interest in the fate of medical marijuana in Utah. But what could be at stake for the potential gubernatorial hopeful is his ability to deliver on an issue that drove Utahns to the polls last November. As Hughes tells it, the battle lines were drawn around Proposition 2 when he invited supporters and opponents of the voter initiative to the negotiating table. With the October release of a compromise backed by groups on both sides of the debate, Hughes declared an armistice among faith leaders, law enforcement, medical groups and cannabis activists. But the proposal to overwrite the initiative language incensed many advocates and patients; this contingent argued the bill was riddled with poison pills and was nothing more than a capitulation to The Church of Jesus Christ of Latter-day Saints and other Prop 2 opponents. And problems have bubbled up since Dec. 3, the date of the whirlwind special session when legislators approved the cannabis act and Gov. Gary Herbert signed it into law. One of the biggest is that few physicians so far have been willing or able to recommend the plant-based treatment to patients, even those whose ailments qualify under the new state law. Intermountain Healthcare, Utah’s largest provider with roughly 1,500 physicians, has told its doctors not to give patients letters of recommendation — at least for now, while they’re working on cannabis guidelines. There are “too many unknown details at this point for these letters to be provided to patients,” Mark Briesacher, Intermountain’s chief physician executive, wrote in a memo. Hughes said after the Intermountain memo was released, he sat down with the medical group’s chief executive officer to weigh in. “You look at the size of that physician network. It’s pretty important that we have their participation,” Hughes said. Oral or written recommendations from doctors were supposed to give qualifying patients interim legal protection from criminal action as they wait for the state’s full cannabis program to ramp up. But people in the past couple of months have struggled to find doctors who are comfortable suggesting medical marijuana treatments, advocates say. The importance of physician participation will only increase once the full program starts, since the new law limits the number of cannabis patients each doctor can take on. For Steve Urquhart, a former lawmaker and Prop 2 supporter, the ongoing outreach by Hughes and others who crafted the compromise bill points to the flaws of the measure they created. Physicians are understandably reticent to suggest the federally illegal substance under a state law that exposes them to risk, he said. “What they [Hughes and others] are doing is ... damage control, and they’re trying to tell these wise people how medicine is practiced and how they really can flout federal law and do this. But there’s nothing to back them up,” said Urquhart, who believed Prop 2 would’ve better protected physicians. Connor Boyack, a cannabis advocate who worked closely with Hughes on drafting the compromise bill, argues the measure does adequately cover doctors from liability. And the state would’ve had to deal with the same growing pains and physician bottlenecks even if Prop 2 had remained in place, he added. Boyack said he appreciates Hughes’ continued interest in the cannabis program’s success. Hughes has spoken with his former colleagues in the Legislature and regulators to keep the state on track to hit its deadlines for the program rollout, Boyack added. The former speaker said he’s also met with the board members of Zions Bank, encouraging them to advocate for federal action to knock down barriers between financial institutions and the cannabis industry. Because banks worry about running afoul of federal law, many medical marijuana businesses operate on a cash-only basis, a setup Hughes finds problematic (“It can’t be any good with cash in burlap sacks being transported everywhere,” he said). Hughes said he’s even talked to his personal pharmacists about the new cannabis bill and brought them handouts that explain the proposal. Perry said it’s not uncommon for former lawmakers to remain involved in issues they shepherded through while in office.